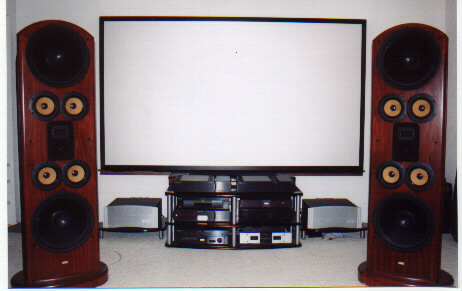 Here is a picture of the front of my Audio and Home Theater Room set up. The power amps include the two AA 90.1a 90watt pure class A monoblocks set atop two Vantage Point Rosewood amp stands. CD playback is via an Audio Alchemy DDS-Pro CD Transport using the modified Stable Platter Mechanism, which supplies a digital signal to the DTI Pro-32 digital resolution enhancer via a Camelot Technologies I2S cable. The DTI Pro-32 is running off the improved PS-2 Power Station, and has the Revision 0D chip upgrade. Rev AD stands for "adaptive dither", meaning that the level of dither applied to the signal is constantly changing, and optimized at all times. The DTI Pro-32 passes the digital signal via a 2nd Camelot Technologies I2S cable to a Camelot Technologies Uther v2.0 Mk3 DAC. The DVD player is the Sony DVP-S7700. 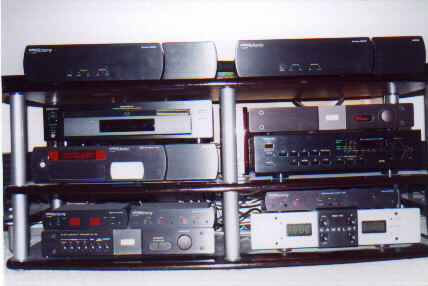 The pre-amp/processor is the Nakamichi CA-1. The Uther is connected to the pre-pro via Nordost SPM interconnects, and the DVP-S7700 is connected via a Nordost Moonglo digital coax cable. Balanced Nordost SPM interconnects are used between the Legacy Whisper Bass Processor and the OM 90.1a Power Amps. Nordost SPM interconnects are run between the Nakamichi CA-1 and the Whisper Bass Processor. 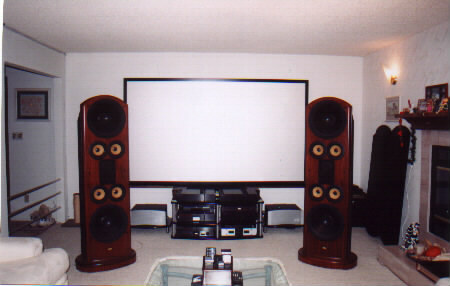 The left and right rear surround speakers are System Audio 950s (not visible in the above picture, see below) which are mounted at the rear of the Audio and Home Theater Room, high and corner loaded and aimed so as to converge at a point just in front of the primary listening/viewing position. 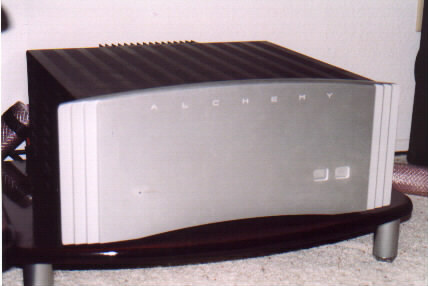 They are run off of one Audio Alchemy OM150 Overture Stereo 150w amplifier, which uses a pair of Legacy Audio Lattice 1m interconnects. An un-used OM150 Stereo amp is visible on the upper right shelf of the Vantage Point Contours Rosewood Audio Rack. The main left and right speakers are Legacy Audio Whispers, in a custom Rosewood, which are fed via a 2.5m pair of Nordost SPM bi-wire speaker cables terminated at both ends with WBT solderless locking terminators. 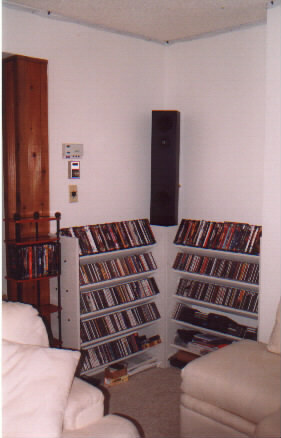 You may notice the absence of a discrete center channel speaker. This is not an oversight. A separate center channel speaker is deliberately not being used as I prefer the excellent phantom center image created by the Legacy Whispers. I found that this was superior to a separate center channel in terms of integration of dialog and on-screen sound effects to the video, especially panning effects. The projection screen is a Draper Clarion M2500 with a 115' diagonal 16:9 aspect ratio. 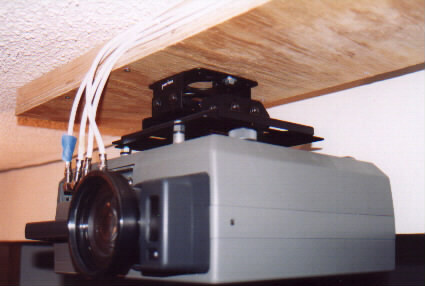 The front projector is a Sony VPL W400Q which is ceiling mounted at the rear of the Home Theater Room (visible in picture at upper left, and additional picture below). 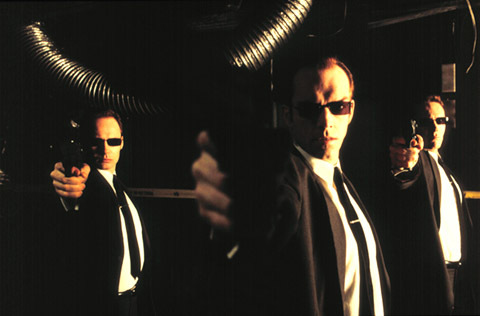 It is fitted with an IMX 923 Optical Image Processor by Cygnus Imaging Corporation, and is connected directly to the Sony DVP-S7700 DVD player via three runs of RG-6 component video coax cable. 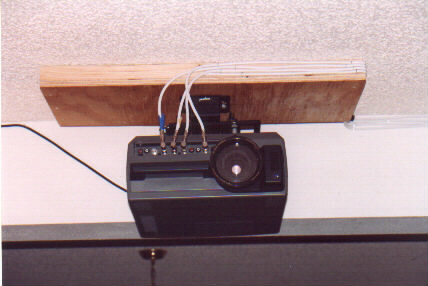 One additional RG-6 run is used to feed the Nakamichi CA-1's OSD to the projector. 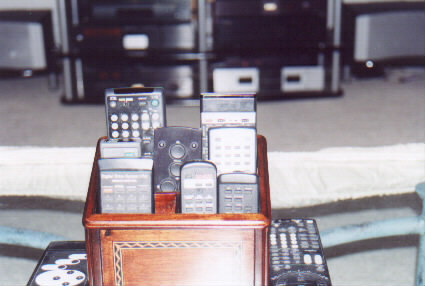 Home Theater and High End Audio are excellent, but expensive hobbies, though considerable costs can be averted, depending on one's personal preferences, by the use of inexpensive wires and cables that are the performance equivalents of the expensive or exotic aftermarket varieties. Regarding component video vs. s-video formats, component video is better than s-video in that it has a higher color resolution. What you may have heard about component "crushing" s-video, or anything like that, is often a major exageration of the differences in video quality between the two. The improvement of component video over s-video is not as substantial as the improvement of s-video over composite. Generally speaking, on small display devices, including big screen RPTVs and large direct view sets, the differences between component and s-video are very subtle and may be hard to detect visibly. Where the advantages of component video over s-video become more noticable is in the large front projection set-ups. We're talking about screens with diagonal measurements of 106 inches and typically quite a bit more. The larger the screen, the more readily apparent the increased color resolution becomes, all other factors being equal. That being said, component connections are very inexpensive to do. RG-6 75 Ohm coaxial cable can be had for as little as $0.12/foot plus a few dollars in terminations. I set up my HT with component video cables that I made in this manner: three 45 foot long runs each, plus one additional 45 foot run to be used as a composite video cable to use my preamp-processor's OSD (On Screen Display). This amounted to a total of 180 feet of video cable that cost under $60. This was compared to a very expensive and highly reviewed Nordost videophile component cable costing several hundred dollars, despite being much shorter in length, and the video was visually indistinquishable between the two cable options. This comparison was performed on the large screen front projection system, 115" 1.78:1, that is featured on this website, using various DVDs as the video source. Such a large image would make it much easier to see any potential visible differences between the two conditions as compared to a small video display, such as a large RPTV or a large direct view TV. Also, the Nordost was a much shorter run than the RG-6. This would further reveal any video inadequacies inherent in the cheap RG-6 cable (were there any), but none the less, as said, the video images were indistinquishable from each other. 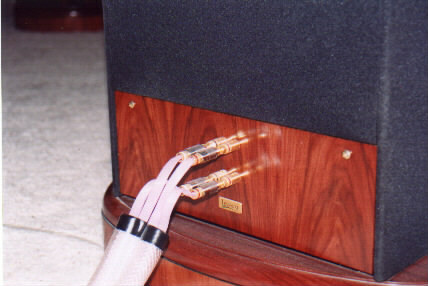 Other wires that are often installed in my system in lieu of the expensive Nordost Reference SPM biwire speaker wires, include Recoton 12 awg copper speaker wire, and a set of 6 foot long DIY Cat5 speaker wires of approximately 14 gauge, both in a single wire configuration and using inexpensive gold-plated spade lug terminators. While nowhere near the visual impression of the Nordost, they are indistinguishable audibly from each other, and from the Nordost wire, despite the 12 gauge wire costing pennies a foot. Just under $0.09/foot, actually. Recently, the Nakamichi CA-1 was removed from the system, and an Outlaw Audio 950 Pre-Pro was installed in its place. This unit offers excellent sound and set-up functions, with all the newest multichannel surround formats including Dolby Digital® Surround EX®, Dolby ProLogic II®, the complete suite of DTS-ES® and DTS Neo:6® processing and decoding, and Cirrus Logics Extra Surround, in addition to 5 Channel Stereo and 7 Channel Stereo modes. This incredible array of surround options assures compatibility with the widest range of source material, delivering 5.1, 6.1 or 7.1 channel sound fields, depending on the users speaker configuration. The addition of the Outlaw Audio 950 Pre-Pro in lieu of the CA-1 has proven to be an excellent upgrade to the Audio/Home Theater system. Close up of Nordost SPM bi-wire speaker cable with WBT solderless locking banana plugs and the Legacy Whisper binding posts. The SPMs are in a protective custom semi-rigid vinyl/nylon mesh tubing. I really need a universal learning remote! Soon I will add more screen shots. Really!